*POST UPDATED July 2017* | As someone who takes damage from sun very seriously (I want to look as young as possible for as long as possible), I’ve been a self-tanning devotee for as long as I can remember. I’ve tried countless brands/formulas and today, I’m sharing my personal best self tanner for medium skin tones (self-tanners that won’t pull orange) along with some of my favorite tips to ensure you don’t look streaky or get the tell-tale self-tanner palms. It all starts with some basic prep work. If this is the first time you’re applying self-tanner (or you’re reapplying after some fading), start with a great canvas. At night, I shower and cleanse use an exfoliating towel ($6, Amazon) with my body wash to scrub-a-dub-dub your legs, arms (don’t forget your underarms, too) and especially feet and even hands. Next, I incorporate these mind-blowing exfoliating mitts ($10, Amazon). They don’t seem like anything special, but you may be grossed out to find how well they will buff dead skin – and old self-tanner – off your body in chunks. Follow by shaving (you don’t want to apply self-tanner to stubble and then shave it off the next day). To prevent streaks and to extend self-tanner lasting on the skin, it’s vital to moisturize. I reviewed the Curel Wet Skin Moisturizer here and it’s perfection pre-self-tanning because it absorbs instantly and doesn’t leave a greasy feeling. I apply this before I get out of the shower while skin is still damp. you ABSOLUTELY NEED a tanning mitt and back applicator! Not only do tanning mitts prevent self-tanner palms, but they blend the product into the skin easier and more naturally… just like the way a foundation brush or sponge applies makeup to the face. Any self-tanning mitt will do. You can find them pretty much everywhere self tanners are sold these days (Ulta, Sephora, CVS, etc). They’ll run you about $5-8 and they’re completely reusable. I’ve washed mine by hand in the sink with dish soap and even thrown them in the washing machine before with no problems. Let air dry. They last me about six months with weekly use. I also invested in a back applicator (affordable alternative @ $6, Amazon) and it’s been life changing; particularly because it’s summer and if my hair is pulled up, I don’t want a giant patch of pale skin on my upper back. This tool is a game changer for my 2017 self-tanning routine! My former favorite self-tanner that I used for years due to its ease of accessibility and a more natural color is the St Tropez Bronzing Mousse. In 2017, I tried the Loving Tan Ultra Dark Mousse and will NEVER go back to St Tropez unless I’m in a massive pinch. First reason is that Loving Tan has absolutely ZERO self-tanner smell. It’s actually so confusing how it works without smelling that self-tanning chemical. Second, it provides the best reddish/olive, natural looking tan shade on my medium/olive skin. Lastly, it lasts longer on my skin and fades much more gracefully (sort of disintegrates instead of patching off). I can apply this every 10-14 days versus St. Tropez lasting about 7-10. I apply my self-tan from the top of my body down, so I start with my arms (skipping hands), chest, neck, stomach, back and finish with legs, feet, and hands. When you do your feet and hands, use whatever product is leftover on the mitt and rub lightly on the tops, making sure you get your knuckles and in between fingers/toes. This is key in getting a natural finish and no harsh lines around that area. I’ll give myself about five minutes to dry (although Loving Tan dries in less than two minutes, no sticky residue), throw some long sleeve/pant PJs on and go to sleep. A quick body rinse in the morning gets rid of any color guard and displays your new, super dark yet natural tan. My favorite part of using the mitts and back applicator is that you don’t have to meticulously wash your hands after you self-tan… which never ends well. That’s how you end up with the harsh streaks and lines on your hands/wrists. Hateee. 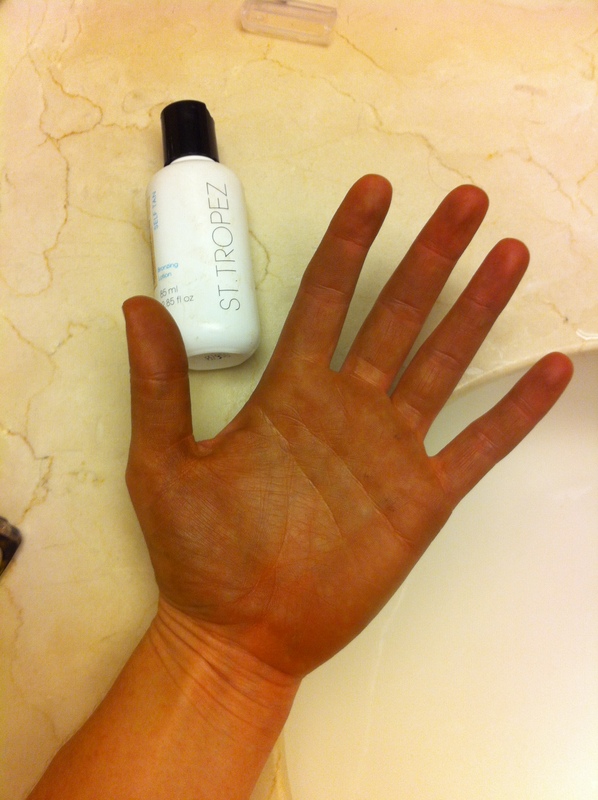 I liked St Tropez’s gradual self tan in medium/deep. It’s made an appearance in my favorites and I loved using this formula throughout the fall/winter. It was super natural and didn’t require all the prep work because it was a body lotion hybrid. In about three nights, I had the same color using the gradual tan as I do with one night of the traditional St Tropez formula. No streaks, even fade, hydrating without being greasy. After July 2017 and trying Loving Tan, I am going to switch to Loving Tan’s Bronze Shimmer Luminous Cream – Ultra Dark in the winter for a more subtle glow. I order Loving Tan products directly from the LovingTan.com website (which ships incredibly fast; the last three orders I’ve done have arrived in less than 5 business days from Australia! ); but they are online from other niche retailers for a bit cheaper. I’ve linked them throughout. I hope this helps my fellow medium/olive skin tone readers find the best self tanner for medium skin tones. Don’t forget to use SPF daily now that more skin will be exposed. 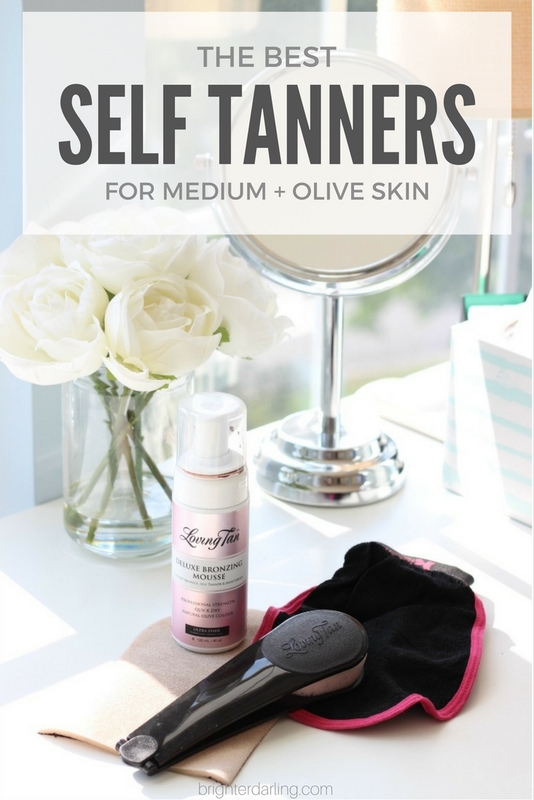 What are some of your favorite self tanners – any I need to try? Let me know in the comments and please share this post using the social share buttons below if you found this helpful. I greatly appreciate it!